Sign up to be an organ donor today. This is the end of my life, but it is not the end of my love. It is not the end of the story. 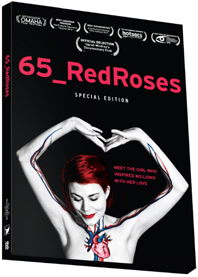 When Eva Markvoort agreed to open up her life through the documentary 65_RedRoses, the result was a powerful message of life, love, and hope. By doing so, she started a global campaign for organ donation and CF awareness. While waiting for a second transplant on March 27, 2010, at the age of 25, Eva’s breath ran out. But her vision did not die. Canadian distributor Hello Cool World is working with the filmmakers and Eva’s family to spearhead a North American campaign. To date, the award-winning film has screened at numerous international festivals and been televised in a dozen countries. It was chosen for OWN Documentary Club in the US. Eva believed that after seeing her film and witnessing her struggle with cystic fibrosis, people would finally understand the importance of supporting CF research and awareness, as well as be inspired to become an organ donor. Our mission is to spread Eva’s campaign for organ donation and CF awareness far and wide! The only funding we have for our outreach campaign is coming through sales of our #4Eva materials or from your generous donations. Hello Cool World is our Canadian distributor and they are also putting their profits back to keeping our campaign going. They are committed to fairer trade and eco practices. Our DVD cases are made without plastic, with recycled materials. We’ve partnered with ethical suppliers for t-shirts that are sweat-shop free and 100% organic cotton.